341 Marlborough is located on the north side of Marlborough, between Gloucester and Hereford, with 339 Marlborough to the east and 343 Marlborough to the west. 341 Marlborough was built ca. 1872 for builder and contractor George Martin Gibson, for speculative sale, one of eleven contiguous houses (337-339-341-343-345-347-349-351-353-355-357 Marlborough). 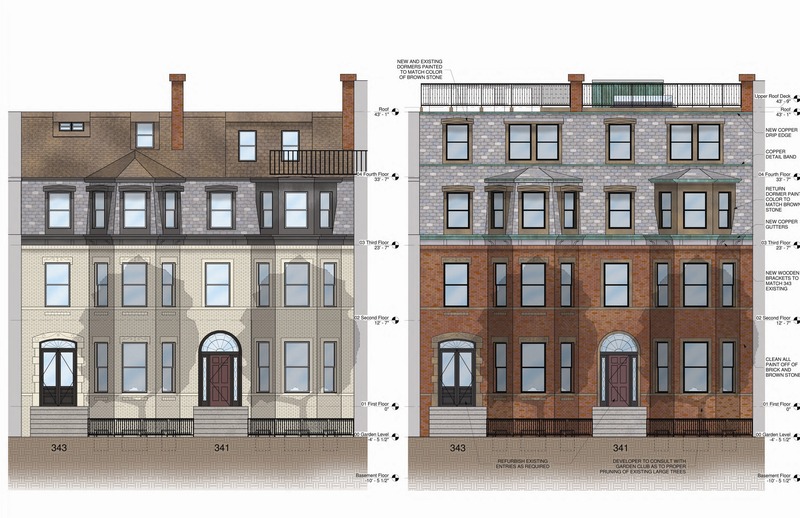 Click here for an index to the deeds for 341 Marlborough. On June 20, 1873, 339 Marlborough and 341 Marlborough were purchased from Hiram Gerrish by attorney Charles Eustis Hubbard. He and his wife, Caroline Dennie (Tracy) Hubbard, made 339 Marlborough their home. They had married in December of 1872. On November 1, 1873, 341 Marlborough was purchased from Charles Hubbard by Hannah Maria (Gibbs) Tracy, the wife of James Dennie Tracy, the brother of Caroline (Tracy) Hubbard. The Tracys also had married in December of 1872. Prior to their marriage, James Tracy had lived at 58 Chestnut with his father, City Treasurer Frederic Uriah Tracy, and stepmother, Helen Elizabeth (Cushing) Baylies Tracy. James Tracy was a wool broker and dealer. James and Hannah Tracy continued to live at 341 Marlborough during the 1875-1876 winter season, but moved thereafter. By the 1876-1877 winter season, 341 Marlborough was the home of Charles Huntington White, a commission merchant, and his wife, Adrienne (Pfaff) White. They had married in February of 1876 and 341 Marlborough probably was their first home together. They continued to live there during the 1877-1878 season, but moved thereafter. On September 23, 1878, 341 Marlborough was acquired from Hannah Tracy by her father, Nathan Bourne Gibbs, Jr. He and his wife, Elizabeth Swift (Burgess) Gibbs, lived at 38 Commonwealth. By the 1878-1879 winter season, it was the home of Joseph Prince Hawes, a stock auctioneer and broker, and his wife, Ellen M. (Hall) Hawes. They previously had lived at 17 Hereford. Joseph Hawes died in March of 1880. Ellen Hawes moved soon thereafter. Nathan Gibbs died in December of 1880, and on May 3, 1881, 341 Marlborough was acquired from his estate by Miss Susan Makepeace Larkin Wales and her sister, Ellen Kate Wales. During the 1882-1883 winter season, Susan Wales, and probably Ellen Kate Wales, were traveling abroad and 341 Marlborough was the home of their brother-in-law and sister, Solomon Piper Stratton and Annie Flagg (Wales) Stratton. They previously had lived at the Hotel Vendôme. He was a dealer in crockery and glassware. They continued to live at 341 Marlborough during the 1883-1884 season, but moved thereafter and were living at 343 Marlborough by the 1885-1886 season. By the 1884-1885 winter season, Susan and Ellen Kate Wales were living at 341 Marlborough again. Ellen Kate Wales died in January of 1885. Susan Wales continued to live at 341 Marlborough through the 1886-1887 season. During the 1890-1891 winter season, 341 Marlborough was the home of William Raymond Driver and his wife, Ellen Salisbury (Brown) Driver. They previously had lived in Beverly, where they continued to maintain a home. He was treasurer of the American Bell Telephone Company. By the next season, they had moved to 321 Marlborough. By the 1891-1892 winter season, Susan Wales was living at 341 Marlborough, but during the 1893-1894 and 1894-1895 seasons, she was again living elsewhere. During the 1893-1894 season, 341 Marlborough was the home of Sarah Elizabeth (Warren) Mason, the widow of John Warren Mason. She had moved to 391 Marlborough by the next season. During the 1894-1895 season, 341 Marlborough was the home of Royal Robbins and his wife, Theresa (Huntington) Robbins. They previously had lived at 375 Beacon. Royal Robbins was treasurer of Robbins, Appleton & Co., agents for the American Waltham Watch Company founded by his father, Royal Elisha Robbins. By the next season they had moved to 44 Commonwealth to live with his parents, Royal and Mary Elizabeth (Horton) Robbins. By the 1895-1896 winter season, 341 Marlborough was again the home of Susan Wales. She continued to live there during the 1899-1900 winter season. In 1900, she was traveling abroad again, and 341 Marlborough was the home of Lydia Bowman (Baker) Edwards Taft, the widow of John H. Edwards and of Orray A. Taft, Jr. She had lived at 441 Beacon in 1899. By the 1900-1901 winter season, she moved to 349 Commonwealth, and 341 Marlborough was Susan Wales’s home once again. In about 1908, Susan Wales was joined at 341 Marlborough by her niece, Miss Alice Stratton Wales, the daughter of her brother, Nathaniel Wales and his wife, Susan Esther (Stratton) Wales (Susan Esther (Stratton) Wales was the sister of Solomon Piper Stratton, who married Anna Flagg Wales, the sister of Susan Wales and Nathaniel Wales). Susan Wales and Alice Wales continued to live there in 1910. In 1910, they were joined by Elizabeth Shaw Greene and her siblings: Gladis Greene, Elbridge Gerry Greene, Quincy Shaw Greene, and Valerie Constance Greene. They previously had lived at 402 Marlborough with their mother, Sarah Ellery Sargent (Austin) Greene, the widow of William Batchelder Greene, Jr. She had died in March of 1907. Elizabeth Greene married in May of 1910 to Samuel Eliot Morison, who later would become a rear admiral and a noted naval historian. In the fall of 1910, Susan Wales again traveled to Europe, returning in late October to spend the 1910-1911 winter season at 351 Beacon with her brother-in-law and sister, Solomon and Annie (Wales) Stratton. During the 1910-1911 season, 341 Marlborough was the home of Mrs. Frances Duer (Jones) Key, the former wife of John James Key, and their two daughters, Jean Frances Duer Key and Katherine Voorhis Key. They previously had lived at 402 Marlborough. 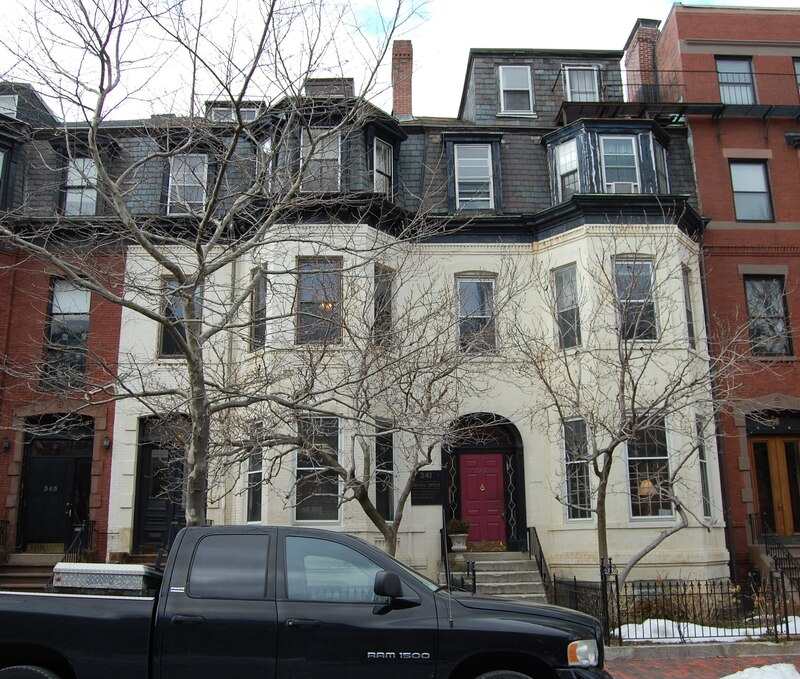 Susan Wales (but not Alice Wales) was once again living at 341 Marlborough by the 1911-1912 winter season, and continued to live there in during the 1919-1920 season. During the 1920-1921 season, Susan Wales was wintering in the South. By the 1922-1923 season, she was living at the Hotel Vendôme. During the 1920-1921 winter season, 341 Marlborough was the home of Mrs. Lucinda Stearns (Winchester) Cunningham, the widow of James Henry Cunningham. 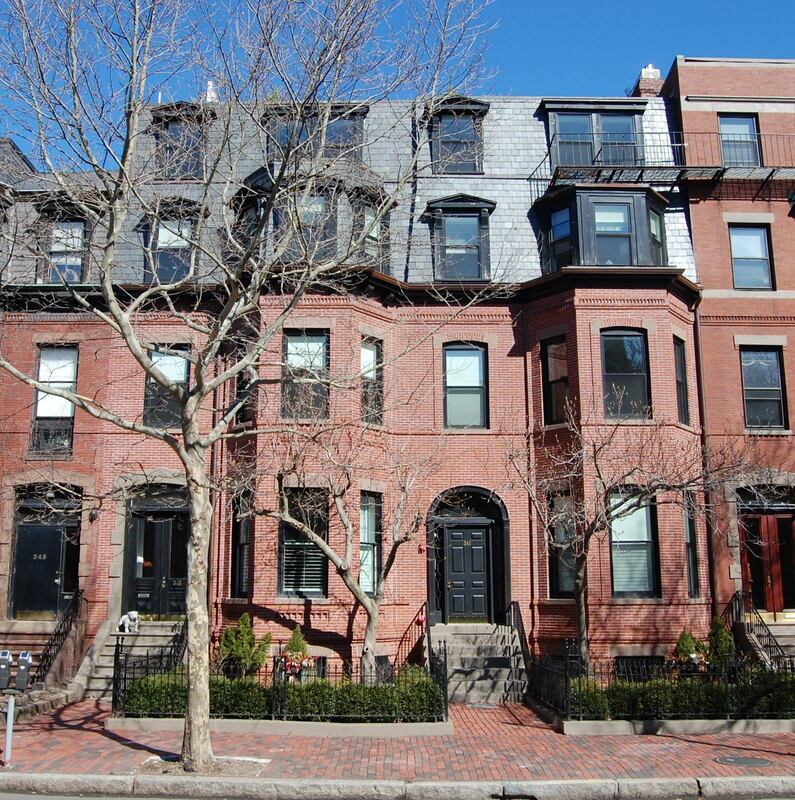 She previously had lived at 351 Marlborough with her son and daughter-in-law, Henry Winchester Cunningham and Mary May (Hayward) Cunningham. Lucinda Cunningham continued to live at 341 Marlborough until her death in January of 1922. 341 Marlborough was not listed in the 1923 Blue Book. On May 1, 1923, 341 Marlborough was acquired from Susan Wales by Mary S. (Moore) Trask, the wife of William Ropes Trask. They previously had lived at 99 Mt. Vernon. They also maintained a home in Marblehead Neck. William Ropes Trask was an attorney. Mary Trask was owner of Miss Moore’s, a clothier for women and children located at 547 Boylston. The Trasks continued to live at 341 Marlborough until about 1932. By the time of his death in 1933, they were living in Lexington. 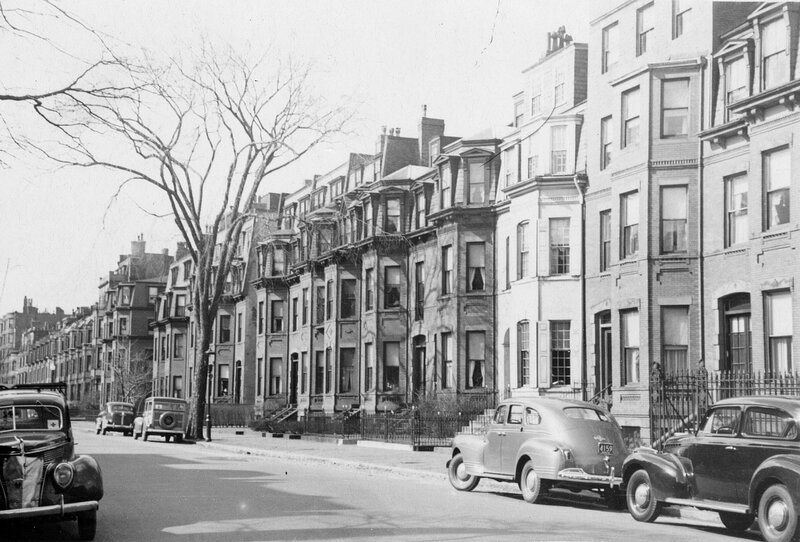 By 1932, 341 Marlborough had been converted into two apartments. 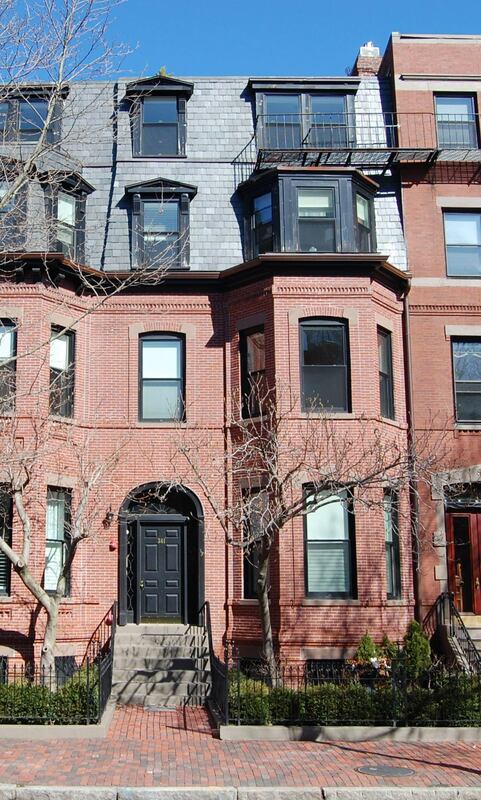 One of the apartments was the home of patent attorney Arthur H. Brown and his wife, Nellie A. (Kenney) Brown. They previously had lived in Woburn. They also maintained a home in Marblehead. The other apartment was the home of J. Laurence Carroll, Jr. and his wife, Emily Anne (Frost) Carroll. They had married in 1931 and 341 Marlborough probably was their first home together. The Browns and the Carrolls continued to live there until about 1933. 341 Marlborough was not listed in the 1934-1937 Blue Books, and was shown as vacant in the 1934-1937 City Directories. On May 21, 1937, 341 Marlborough was acquired from Mary Trask by Katherine M. (Garrett) Butterworth Sperry, the wife of George Henry Sperry, a sales representative for a shoe manufacturer. They lived in one of the apartments. They previously had lived at 270 Bay State Road. George Sperry died in 1939. 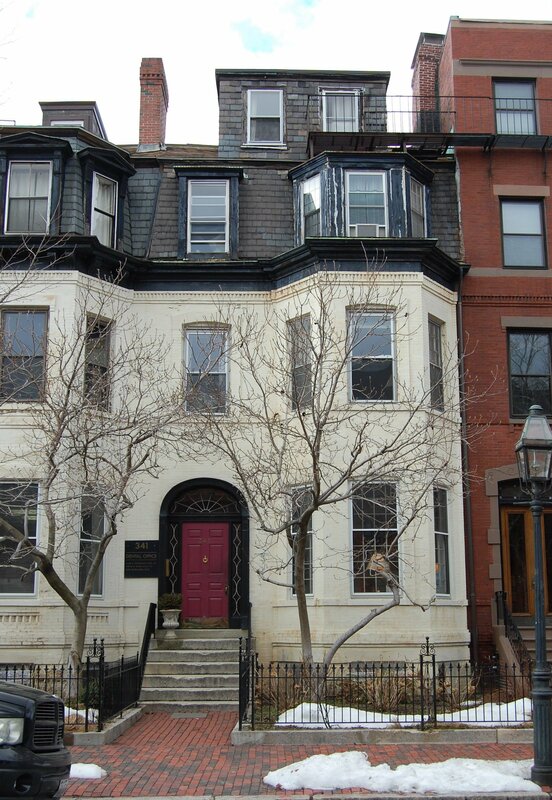 Katherine Sperry continued to live at 341 Marlborough until 1944. She was an antiques dealer. The other apartment was the home of Hans Rudolph (Rudolf) Giger and his wife, Helen-Mae (Kidd) Giger. They previously had lived in New York. He was a dealer in artists’ materials and supplies. They continued to live at 341 Marlborough in 1939, but had moved to an apartment at 250 Commonwealth by 1940 and to 292 Marlborough by 1944. In 1941, the Gigers’ former apartment was the home of Walter T. Spaulding and his wife, Romelda Spaulding. They previously had lived in New York. He was serving in the US Navy. They continued to live there until about 1944. On February 8, 1944, 341 Marlborough was acquired from Katherine Sperry by Miss Katherine Prescott, a lecture arranger, who lived in the apartment previously occupied by Mrs. Sperry. Her mother, Mae F. (Manning) Prescott, the widow of Linnaeus C. Prescott, lived with her. They previously had lived in an apartment at 453 Beacon. Mae Prescott died in February of 1947. Katherine Prescott continued to live at 341 Marlborough until about 1949. 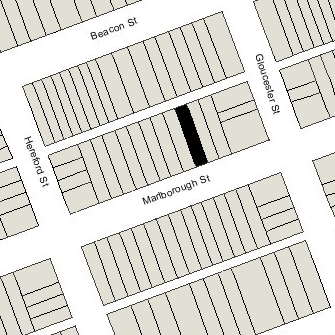 On June 30, 1949, 341 Marlborough was acquired from Katherine Prescott by William Henry Allmon, Jr. A July 10, 1949, Boston Globe report on the transaction described the property as consisting of one duplex apartment and one triplex apartment. William Allmon lived at 341 Marlborough with his parents, William Henry Allmon and Margaret Dell (Trenholm) Allmon. They all previously had lived in an apartment at 78 Commonwealth. William Allmon, Sr., died in October of 1950. William Allmon, Jr., and his mother continued to live at 341 Marlborough until about 1953, when they moved to Newton Centre. On October 30, 1953, 341 Marlborough was acquired from William H. Allmon by real estate dealer Marion S. Hodgdon. On October 18, 1954, it was acquired from her by Dr. Lloyd Harold Warshauer and his wife, Esther E. (Hamm) Warshauer. He was a dentist and he maintained his offices at 341 Marlborough and leased the second apartment to others. He and his wife lived in Waban. In June of 1963, Lloyd Warshauer acquired 343 Marlborough. By the mid-1960s, he had subdivided 341 Marlborough into three apartments plus his dental offices. He subsequently leased additional office space to other dentists.